August MLS® unit sales decreased by less than 4% (1,241/1,290) while dollar volume was up almost 1% ($298.7 million/$296.6 million) in comparison to the same month last year. Year-to-date MLS® sales are ahead by 2% (9,387/9,196) while dollar volume has increased 7% ($2.30 billion/$2.14 billion) compared to the same period last year. Listings entered on the MLS® this year are also trending higher than previous years at this point in time. The most active price range for residential-detached sales continues to be the $250,000 to $299,999 price range with 22% of total sales. Although the next lower price range from $200,000 to $249,999 was close behind at 21%. 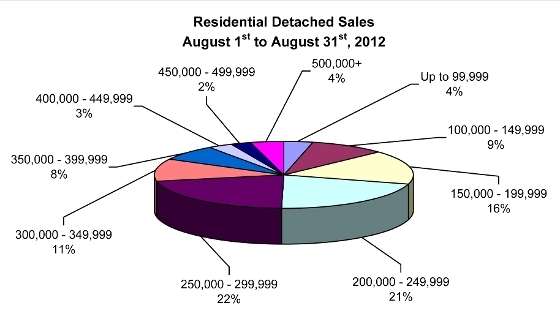 August 2012 showed how diverse WinnipegREALTORS® housing market is with house sales of $850,000 and $15,000. Condominium sales activity is most prevalent in the $150,000 to $199,999 price range with 33% of total sales. Average days on market for August residential-detached sales was 29 days, 3 days slower than last month and one day slower than August 2011. Average days on market for condominium sales was 34 days, a full week quicker than July, but 4 days slower than August 2011.